Volume 1 / Issue 2 Our news! Tameside General Hospital has some new and amazing Artwork!! When there was a request on a Glossop based Facebook page for some artwork to brighten up the day room on the Cardiac Ward in Tameside Hospital – we thought – we can do that!! Using donations from the High Peak Borough Councilors Initiative Fund we bought materials and frames. 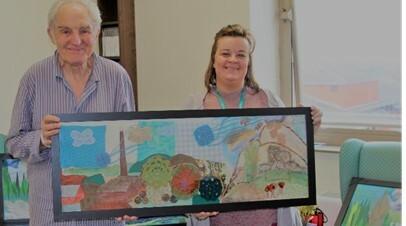 The Arts for Wellbeing groups on a Monday and Friday made collaborative pictures inspired by the landscape and scenery around the hospital in Ashton-Under-Lyne. We took pictures from the fifth floor where the ward is and the view stretches to Mossley and Hartshead. 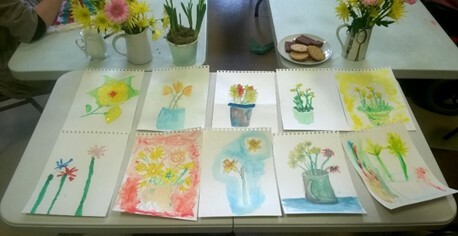 We have finished our four sessions funded by Derbyshire County Council Intergenerational department. 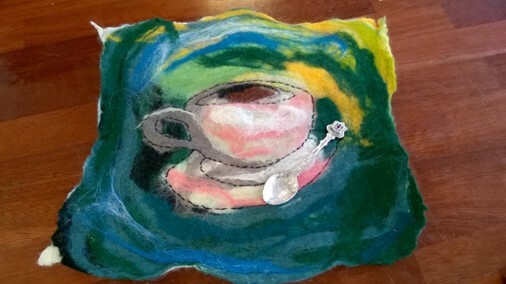 This project was a collaboration between Glossop Arts Project, High Peak Community Arts, DCC and Glossopdale Community College. Our evaluation, which will be available on our website after Easter, shows overwhelming positive response. We are hoping for more funding for further sessions, watch this space. These sessions are aimed at people with long-term physical and mental health conditions in Glossop and the surrounding area. These regular art/crafts music and movement sessions for adults with learning disabilities and cost £4.50 per person per session.